My honey and I stopped at a Kentucky Fried Chicken restaurant on a whim this evening. We laughed on the way in, because neither of us have set foot in one for at least 20 years. If asked to pick one word that described the meal, I would have to go with… gross. Salt and flour were all I tasted. The part that should have been crispy was more sludgy. I have never seen macaroni and cheese in that shade of orange. It’s safe to say it will be at least twenty years before we try it again. Then I read the ingredient list: HIGH FRUCTOSE CORN SYRUP, CORN SYRUP, SUGAR, HONEY, FRUCTOSE… AND 7% REAL HONEY! Say what? Why are high fructose corn syrup, corn syrup, and fructose all in there? Is high fructose corn syrup not fructose enough without added corn syrup? What is the difference between high fructose corn syrup and a mix of corn syrup and fructose? Aren’t they all the same thing? What the heck is the sugar doing in there? Do corn lobbyists have big ownership in YUM Brands? Is the Colonel’s grandchild married to a powerful corn baron? And what’s wrong with plain old honey? I looked online for the nutrition information for KFC Honey Sauce. Had my husband consumed all six packets, he would have ingested 180 calories, 30 grams of sugar, and 48 grams of carbohydrates. The ingredient list stopped him cold. While I was looking for that information, I read (on the YUM Brands site) that they opened 500 new restaurants in China in 2010. There are now over 3,300 KFCs in mainland China and they are opening a new one each day. Think of all the honey sauce! China will have a diabetes epidemic in the wink of an eye. 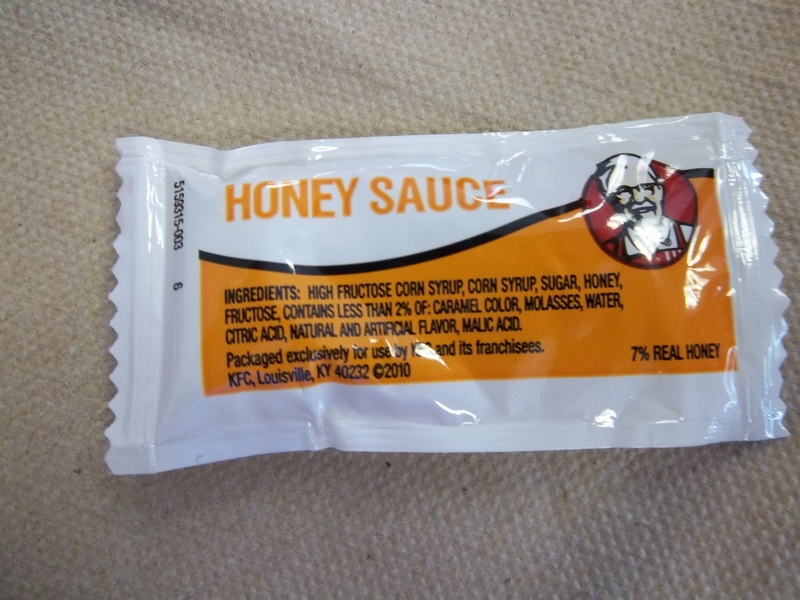 I know, the diabetes epidemic in this country is not a direct result of KFC honey sauce. It is the result of super-sizing and of HFCS being added to our food. We have not been paying attention — if we did, we would know that American consumption of HFCS has increased 1,000% since 1975. I have to go eat brocoli. NOW. A few years ago I had a coupon for a free meal from KFC- picked up the meal and took a bit or two and into to the trash it went!!!!!!! Thanks for all your good blogs-really enjoy! So it’s not just me… Thanks for the kind words. I do love me some fried chicken (and fried shrimp and french fries and other fried stuff), and am not a health food fanatic by any stretch of the imagination, but when it comes to KFC – and especially your description above – I must say…yuck! And I actually did read or hear something about China starting to see obesity and diabetes in its urban populations for the first time ever in that country’s history (and China’s an old damn country). Don’t forget fried okra. I’d rather have that than dessert, but it has to be done right! And I doubt the Chinese ate corn syrup before the last couple of decades… Sometimes tradition is a real good thing to stick to.